Joseph Smith Jr., founder of the Mormon Church, did not know precisely where the City of Zion would be built. But he knew exactly what it would look like. In the early 1820s, Smith founded the Church of Jesus Christ, whose followers became known as Latter-day Saints, or Mormons. In 1831, Smith and his followers set out from upstate New York to seek a location where they could create a "New Jerusalem" in North America - a place mentioned in the Old Testament of the Bible and interpreted by Smith based on a revelation he had experienced. The Mormons referred to this place as the City of Zion. This quest sent Smith and his followers on a circuitous path that led through Ohio, Missouri, and ultimately back eastward to Illinois. But in each of these places, the Mormons experienced serious conflicts with non-Mormon locals. Factoring into these conflicts were the Mormons' questionable financial dealings. Smith was murdered in Nauvoo, Illinois after a bank failure in 1844, and the task of finding a site for and the building of the City of Zion fell to Brigham Young, Smith's successor as church leader. Young led the group on to Utah. There, they found a place where they could set up a society unperturbed by diverse ways of life. For guidance in creating their new town, which they called "the Great Salt Lake City" for its proximity to the Great Salt Lake, Young and the other church leaders looked to the Plat of the City of Zion, a planned grid of city streets, public squares, and blocks Smith had laid out 13 years before he died. On the Plat of Zion, the streets were as wide and the blocks as large as Smith's ambitions, and in Utah, there was room to build them. Smith's plan was intended to accommodate 15,000 to 20,000 people and included a grand central plaza to house the church's temple. 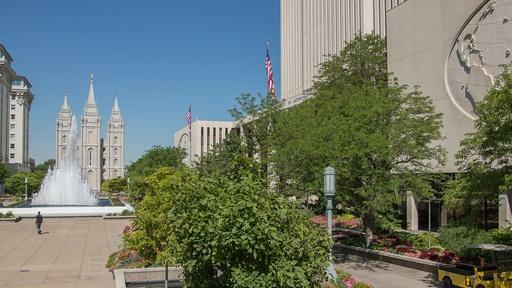 Salt Lake City's	Temple Square is today home to a number of church buildings, including a conference center and the famed Mormon Tabernacle. After Salt Lake City, the Mormons went on to build hundreds of towns in Nevada, Arizona, California - all based on Smith's original guidelines. Learn more about Mormon history. Explore a detailed explanation and view of Smith's Plat of Zion. Plan a visit to Salt Lake City. 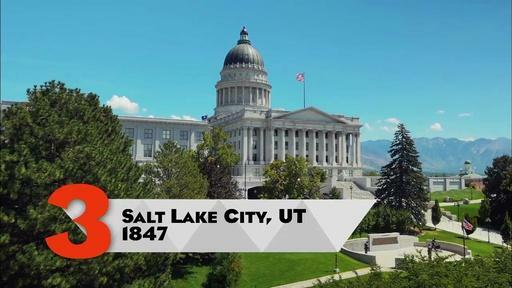 Joseph Smith never made it to Utah, but his “Plat of the City of Zion” became the blueprint for the town built under the leadership of his successor, Brigham Young.